An Astrophotographer, David Lane, travels through the USA capturing the Milky Way and star systems at various natural landmarks. 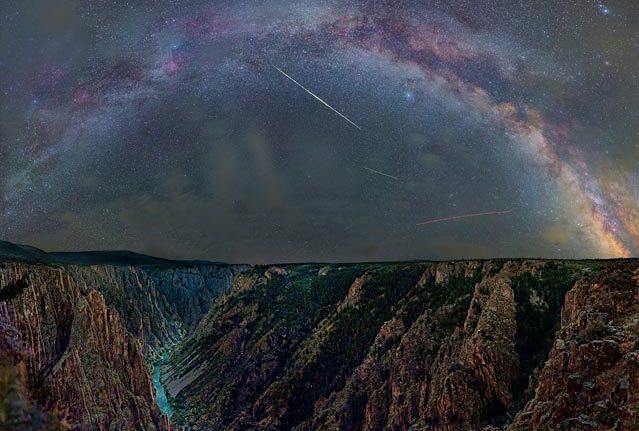 The picture above was captured from the Pulpit Rock Overlook at the Black Canyon of Gunnison National Park in western Colorado. In the image Lane also captured two Perseid Meteor strikes (the white lines). The red line is an airplane. Follow David Lane on Facebook for regular astrophotography updates.